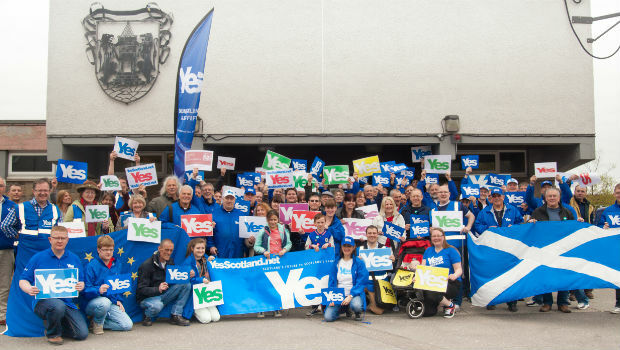 Around 100 Yes supporters from across Fife gathered in Dunfermline on Saturday for the first in a series of planned mass canvass events ahead of the independence referendum. The “Super Saturday” event brought together Yes Scotland supporters from across Fife to speak to voters on the doorsteps of Abbeyview. And the results were a resounding Yes for independence, with 65 per cent of those who have made their minds up saying they will be voting Yes on September 18. Of the 472 responses to the question “should Scotland be an independent country?” a total of 212 (45%) were Yes, with 115 (24%) saying No and a further 145 (31%) undecided. Excluding don’t knows, the results were 65 per cent Yes to 35 per cent No. Organiser Marie Penman said: “There was a huge buzz of enthusiasm and positivity throughout the event. The event was jointly organised under the Yes Fife banner by Dunfermline Central Councillor Neale Hanvey and Yes Kirkcaldy’s Marie Penman who were inspired after hearing about similar activity in Edinburgh. Almost 500 voters in the Abbeyview and Brucefield areas were spoken to by canvassers, with other activists readying a 16-page Yes newspaper for delivery across Dunfermline in coming weeks. Councillor Hanvey described the results as “encouraging” and the group is already planning another mass canvass next month. Another Super Saturday event is being planned by Yes Fife for June 7, with the location yet to be announced.